Tough to get your kiddos outta bed on a Saturday? Me, too. I coax them outside with the promise of apple fritters. We’ll head out to Patterson Fruit Farm in Chesterland where starting in mid-September you can pick your own apples on Saturdays and Sundays – you’ll even take a wagon ride out into the orchard. Call before you go to make sure the apples are ready. To supplement our apple crop, we buy a few apple fritters to share — they’re massive so one easily feeds 3 people (even adults). 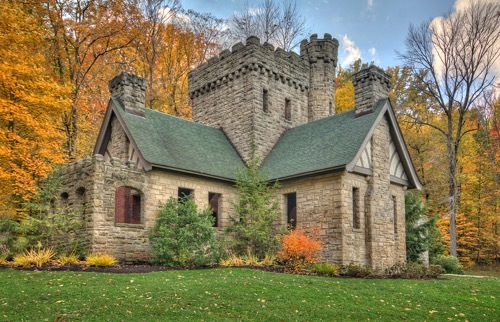 We bring our stash with us to nearby Squire’s Castle, which is just a short, 10-minute drive into the Cleveland Metroparks‘ North Chagrin Reservation. Walk through the empty castle before trekking through the trails tucked just behind. it.